It is hard to imagine a time when not everyone was familiar with Styrofoam, but evidently in 1957 it was not a household term. Its use in ready-to-fly and almost-ready-to-fly models is ubiquitous nowadays. If anything, 'balsa' is the unfamiliar term amongst modelers anymore. There's nothing bad about the reality, unless you're the old fogey nostalgic type (like me). I have no problem letting go of NiCad batteries and replacing them with higher charge density and lower weight LiPo batteries, and Monokote has been one of my favorite covering materials for decades, but then so had Silkspan and dope (a term known mainly now to full-scale aircraft home-builders and to newly legal Colorado potheads). But, I digress. The 1/2A Satellite is still a useful design for gas free flight. 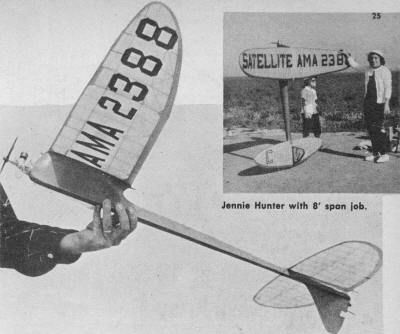 It is one of a long line of Satellite incarnations designed, built, and flown by the father and son team of Bob and Bill Hunter. 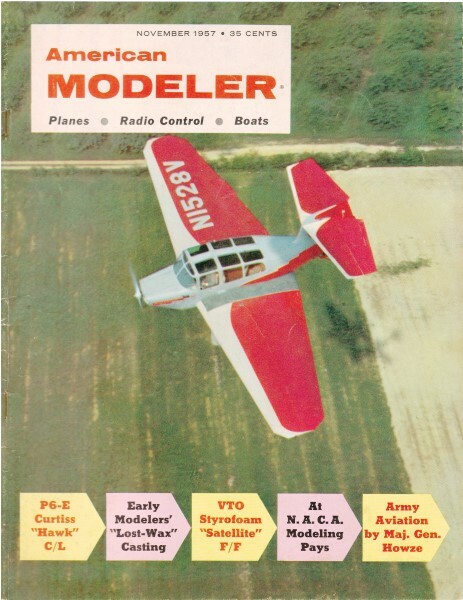 See the May 1972 article on the Satellite 1000 model. 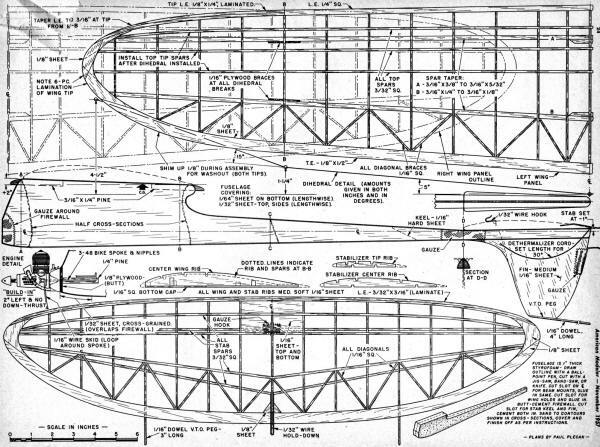 In a constant effort to utilize all the power of current half A engines, modelers have tried every combination of size and weight to find a model which would offer a fast climb and a real floating glide, without the dire consequences resulting from a tricky small ship, or the dissatisfaction of an overweight behemoth. Styrofoam has provided the answer. It also has benefits which were totally unexpected. For those who are not familiar with Styrofoam, it is a polystyrene plastic manufactured by Dow Chemical Co. It has many commercial uses, from floral packaging to use as a filler in the wings of our fastest jets. It combines a weight of 29.32 ounces/cu. ft. with a tensile strength of nearly sixty-five pounds/sq. inch. Model cement melts Styrofoam to a small puddle, so water soluble glues are used as an adhesive for all planking. I use Wilhold White glue, a product of "Acorn Adhesives Co.
Styrofoam may be obtained from your local plastics house or at almost any florist's shop, at one-sixth the price of balsa. Easily cut with band saw, jig saw, or even a sharp knife, an entire fuselage of many compound curves, can be sawed and sanded, ready for planking, in an hour. A simple box fuselage could be ready in ten minutes. Interested? Right! After several tests on small pieces, a 1" x 6" x 36" piece of Styrofoam was obtained, and the Satellite was on its way. As work progressed, I found a feather weight fuselage resulting, which would stand terrific twist and strain, and even though covered with 1/32 and 1/64 balsa sheeting, had a smooth hard surface which would take a high gloss paint job without scalloping. Now, even more sure that an answer was near, completion of the wing and stab was rushed (for Sunday) and it certainly was no disappointment. Testing was soon completed, due to the stability resulting from the large area, and full power applied to the Holland Hornet. Easily as fast as any ship on the field, it pulled out into a tight left glide at the end of a smooth, open, power pattern and seemed to almost stop as though suspended. Construction: With a ball point pen, draw the fuselage side profile on the Styrofoam and cut to shape. Using the ball point, scribe a center line from front to rear, top and bottom, and outline firewall, beam mounts, keel and fin. Cut slots for beam mounts, keel and fin, wing pegs as noted and install, using a smooth even coat of glue. It can be applied by fingers or a brush and will wash clean in tap water. After these installations are made, sanding may be completed, using cross sections on plan as a guide. I use 20 x 2" flat pine blocks with 1/2-60 3M Garnet paper attached by contact cement, for flat surfaces and straight "sanding. One inch and 1/2" dowels with garnet serve as blocks for sanding compound curves. 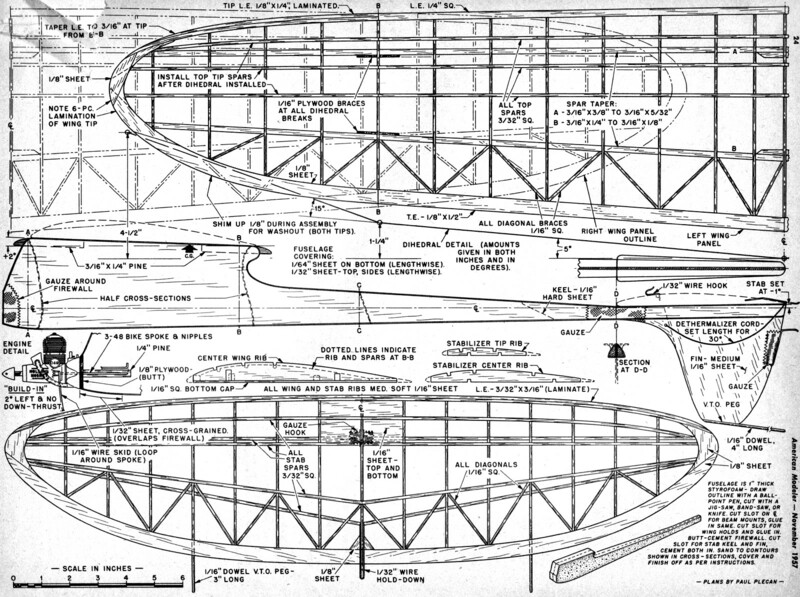 Although the exact cross sections are not critical, maintain the wing and stab angles as specified. Plank the bottom first with 1/64" balsa sheet, lengthwise, and 1/32" sheet cross grain at the nose section and over firewall edge. In planking. cut sheet to approximate outline, and dampen outside of sheet with a damp cloth. Apply a film of glue to dry side, and set in place using straight pins where necessary. Allow to set a few minutes and trim edges to shape. Now for the sides. If care is taken, both sides may be obtained from one 4" x 36" piece of 1/32. Place sheet against fuselage, press in gently at the rear of the pylon to fit the concave curve. Mark from opposite side with ball point, allowing some overlap as a margin of error. Cut and fit and make the other side from this pattern. Now, apply one side only, using same method as bottom and, since the balsa is wet, it will curve in two directions easily. Use masking tape to pull tightly into place and around edges, spiraling it down neatly. Let dry and remove tape. Sand edges from opposite side and apply other panel in same manner. Remove and glue residue on the outside with a damp cloth. Attach wing and stab platforms, sand, and apply gauze as specified, with several coats of cement. Attach V.T.O. peg and hold-down wire to fin. Finish with one coat of butyrate sanding sealer - Jap tissue - two coats of clear and one color dope, or three coats of clear dope. I use all-butyrate for its fuel proof qualities. Wing and stab are of conventional construction. Use care in selecting wood, and a light, strong, structure will result. Make a plywood template of the center ribs for both wing and stab. Utilizing the reference lines at the leading edges, move the template out, making one rib at a time. Keep the template leading edge always on the reference line and mark actual leading and trailing edges on the template at rib junctions. Cut two ribs of medium soft sheet at a time so that a matching set will be made. Mark correct depth of leading and trailing edges on each set and using the top of the ply template, cut camber from correct marks on template. This gives a wing and stab which taper correctly spanwise and in depth. Layout leading, trailing edge, laminated tips, 1/16 bottom caps (wing only) and lower spars for wing and stab. As ribs are set in, cut spar slots for a close fit. Angle center rib of wing outwards 5 degrees at top for dihedral angle. Top. spar cuts may be made now on inboard wing and stab, starting from center and laying in 3/32" spars as you go for alignment. Raise wing tip 15 degrees from outer dihedral joint with a 1/8" shim added at the trailing edge for washout. Install tip spars now in same manner as center and 1/16" anti-warp bracing. Join left panel, install center dihedral, blocking one tip up ten degrees at outer dihedral break. This gives 5° in each inboard panel. Jennie Hunter with 8' span job. When dry, remove wing and stab from plan, sand, install stab hooks of 1/32" wire, cover, using Jap tissue and three coats of clear butyrate dope. Attach V.T.O. pegs to stab, .040 to .625 wire landing skid, dethermalizer limit string, and don't forget me fuse! Power pattern should be a wide open right spiral. Tilt stab for a left glide by shimming 1/32" full chord between stab and platform, on left, when viewed from rear. Spot glue shim in place. Since the 1/2A Satellite was completed, a slightly larger version has been built (1300 sq. inch), using Styrofoam also, with 3/32" planking. Since then I found 1/16" planking would have given it all the rigidity necessary. This ship, powered by a Super Tigre "60" has a total lifting surface of 1840 sq. in., weight 70 oz. including a 9 oz. nose weight (because of the short nose moment). Experiments toward Styrofoam-filled leading and trailing edges, box spars, and complete glider wings of extremely thin sections show great possibility. Any correspondence along this line would be appreciated. Address the author in care of American Modeler.